I think I look forward to these Zenkoku handshake events even more than the individual events. 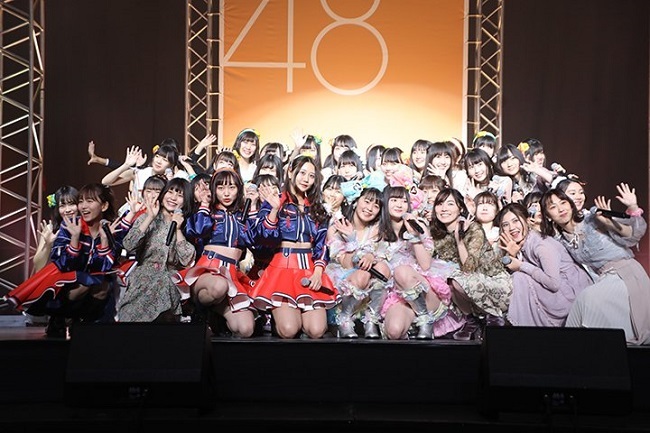 Granted, you don’t get much time at all to actually talk to the members, but you DO get a chance to shake hands members that you might otherwise never meet. It’s always a crapshoot, but at just about every event there is at least one member that impresses me out of nowhere. This event was no exception. I kinda waited until the last minute on this event. As of yesterday I had no tickets, although I knew I could purchase CDs at the venue. Ultimately I had a friend with a bunch of tickets, and he wasn’t going. So he tossed me a handful. I bought two more at the event to make seven tickets in total. I was also hoping that they would be doing make-up for Souda Sarina, who missed an individual event last year. I have been holding this ticket for almost eight months, and have not heard about any recourse. So I was somewhat disappointed when they announced they would be holding a special lane for make-ups for Ichino Narumi, and not Souda. But I digress.. The highlight of the mini-live had to be the 3rd gen. draftees. They are quite the adorable little group. They all did their personal introduction, and then performed Igai ni Mango. I could be wrong, but I don’t think they were singing live. I thought Hirata really shined on stage. And the two petite girls, Otani and Nishi, are both adorable and full of personality. Anyway, that was my first impression. 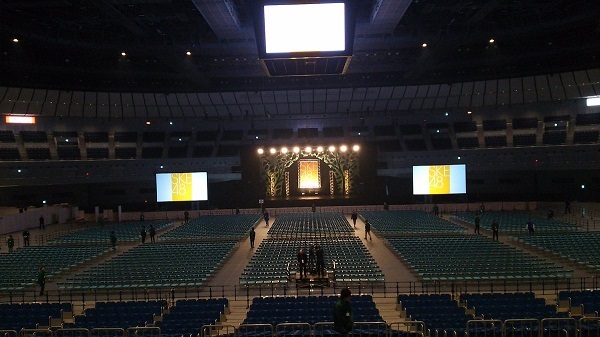 This is the first time I can think of where they did a ‘mini-live’ event at Yokohama Arena. Minarun commented during the first MC, and I absolutely agree, that it actually felt like a big concert. Granted, the arena wasn’t at capacity, but the stage and seating setup really made it feel that way. Tani/Kaotan W-center on Aishiteraburu! Obviously that’s heaven for me, although somebody was off-key in the chorus. This one was definitely done live. Also, they didn’t make too big a deal about Ichino’s pending graduation, aside from having her out front for a couple of songs. And finally, they showed a preview of the new SKE TV show, the one where they are in a public bath. Should be interesting. Anyway, the live ended, and we had over an hour before the handshake event started. I bailed, and then returned just before doors. I wanted to use my first ticket on a “heavyweight” before the lines got too long. But who would I choose??? Matsui Jurina (Lane 1) It was between J or Dasu, and I have tickets for both of them next month. I decided to go with Jurina since the person who gave me the tickets is a Jurina fan. The queue was huge, but I was confident it would go relatively quickly. This was also when I ran into @Boma Adhi in the queue. Eventually it was my turn. Jurina started to pull the “wow, a foreigner” thing with me, but I think she remembered that she has met me before on multiple, although sporadic occasions. Anyway, I got out that the tickets I was using belonged to ….-san, and she was like “Ehhh, Uso!! !” Lucky for him, I didn’t have time to tell her that he didn’t come because he was more interested in seeing HKT today, LOL. Kamata Natsuki, Matsumoto Ckikako, Matsumura Kaori (Lane 6) Kaotan had some of the shorter queues of the day, but the lines move so fast, you can use a lot of tickets rather quickly. I had no idea what I was going to say to Kamata, so I basically introduced myself. When I got to Chikako, I reminded her of a fun experience I had with her when she was in the booth next to Mikitty a couple years ago, and she seemed to remember it. Finally, Kaotan asked me if I enjoyed the live, and how many times I would be seeing her today. LOL Kaotan, such a detective. I told her I would see her again a little later. Inoue Ruka, Tani Marika, Goto Rara (Lane 11) I actually went to this lane before Kaotan, but then realized it wasn’t opening until 1:30. By the time I came back it had swelled to three times the size. But I actually had a while until my planned next ticket. Eventually I made it to the front. Wow, Ruka-chan, nice English!!! I expected to hear English in this booth, but not necessarily from her. She spoke quite fluently, and without much accent. It actually reminded me of my first ever encounter with Akiyoshi, which went much the same way. I told Tani that I loved her W-center, and it was the best part of the show. Finally, Rara started speaking to me in Japanese, but then switched to English midway through, LOL. I responded to her in Japanese though. Sugawara Maya, Nakamoto Izumi, Matsumura Kaori (Lane 6) Back to visit Kaotan, but with a different supporting cast of characters. Tani caught me in this lane as she was passing to go backstage, and gave me a nice wave. Meanwhile, I could see Kaotan and her crew entering since they were on camera. Kaotan was wearing pink Crocs (Tani was too!) Sugawara started introducing herself, but I explained to her that I was friends with …-san, who she knows. “Wow, really?” For Izumi, I had nothing, so I basically introduced myself. And then I asked Kaotan about her shoes. She told me not to tell anyone, but then I asked if they were comfortable. She laughed and said yes as I was pushed out. 3rd Generation Draft Members (Lane 12) I was really impressed with them during the live, so I made a point to save a ticket to meet them. During the live, I had earmarked Hirata Shiina as possibly my favorite, with Nishi Marina a close second. But I also thought Otani Yuuki was really cute. I actually lined up very early for this lane, and it was a good thing, since by the time the lane opened the queue had almost swelled to “Jurina-level.” Not a complete surprise, since it seemed like most everyone has been charmed by the new draftees. Since I had never met any of them before, and they are so new, I spent my time in the queue memorizing their names. It’s nice that they all have a different look, which made it easy. So as I stood in front of all of them, I made a point of saying their names. (Although they were ultimately wearing badges, so my memorizing was kind of pointless) Anyway, saying their names got a lot of good reactions.Kouzuma Honoka was first, and I stumbled on her name, but I knew Otani, who was very genki and cute. Perhaps the best reaction I got though was from Nakano Airi. For some reason they kinda forgot about me for a few seconds, which gave me a bit of time to talk to her. I told her that I enjoyed watching them all perform, and she said my Japanese was very good. Finally I got good reactions from Nishi and Hirata, especially when I told Hirata that she was my favorite new member. Obata Yuna, Tani Marika, Nomura Miyo (Lane 11) Again Tani had a very big line, although I’m sure sharing a lane with Obata had a lot to do with it. 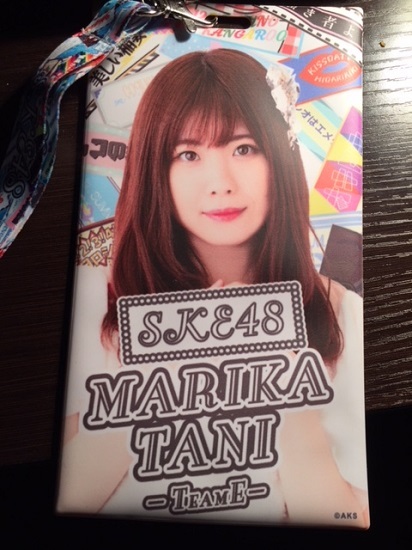 I had removed my Kaotan ticket holder, and replaced it with Tani. I was ready! Obata was first, and I pretty much said the same thing I told her the first time I met her, that I adore her smile. Actually, I do have a lot more I would like to say to her, but it would take a normal handshake ticket to convey it. Perhaps that’s something I will plan for the future. I held up my ticket holder, “I bought it!! !” Tani had already noticed it, and was gesturing toward my chest as I said it, then she raised her hand and gave me a high-five. I had nothing for Miyo, so she just said thank you for coming, basic stuff. Hidaka Yuzuki, Nojima Kano, Aoki Shiori (Lane 4) I always try to meet Yuzuki at the Zenkoku events. Plus, I like Aoki, and I don’t remember ever meeting Nojima before. So it was decided. It was a very short queue, and the three of them were on the big screens as they entered into the handshake area. Yuzuki was making faces at the camera. But we had to wait for Shiori who was late coming out. Yuzuki gave me a big osashiburi!!! I asked her how she was, and told her I enjoyed watching her onstage. I basically introduced myself to Nojima, and said osashiburi to “Shiori-chan” For some reason “Shiori-chan” got a laugh out of her. She then pointed to my ticket holder and asked if I oshi’d Tani. I didn’t have any time to explain it, so I just said yes. And that was it, I made a beeline back to Shin-Yokohama Station and headed back to Tokyo. SKE will be doing an entire weekend of handshake events in Saitama next month. I am going to the Saturday event only, since that Sunday I have the HKT Shamekai event, AND a Wasamin cheki event. So that’s going to be a busy weekend.